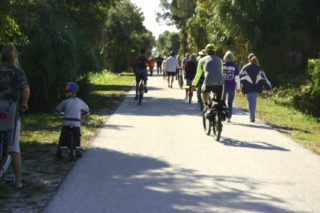 The funding details remain to be worked out, but the Sarasota County Commission this week committed itself to finding a way to pay up to $40 million to acquire the 7.5 miles of rail corridor needed for the North Extension of The Legacy Trail. With a unanimous vote, the board authorized County Administrator Tom Harmer to continue to negotiate with the Trust for Public Land so the county can create the segment from Culverhouse Park to downtown Sarasota’s Payne Park. The motion by Commissioner Mike Moran included direction to staff to work on all possible funding sources, including the potential for a public referendum. On Feb. 14, the Trust for Public Land signed a contract with the owner of the property — CSX — to purchase the land, Isaac Brownman, the county’s chief engineer, told the board during its regular meeting on Feb. 15. (CSX leases that part of the rail line to Seminole Gulf Railway.) The plan calls for the nonprofit to transfer the property to the county, he added. Tentative terms would require the county’s first payment by the end of this year, with the second in 2018, Brownman continued. Adding in the expense of transforming the property into the North Extension is expected to bring the total cost of the project to a range between $56 million and $60 million, Brownman said. That would include the design and construction facets of the work, he pointed out. Staff already had scheduled a budget workshop on Feb. 17 for the commission to decide how to pay for several funding priorities, including new courtrooms on the county’s R.L. Anderson Administration Center campus in Venice and a new Central Energy Plant to replace critical equipment that provides air conditioning to several county buildings in downtown Sarasota — the jail, among them. The board members agreed that the timing of that workshop could not be better, as they would be able to talk about options for the North Extension purchase, as well. “Hopefully, by Friday, we … will figure out a path to victory here,” Detert said. During his Feb. 15 presentation, Brownman noted that the first segment of The Legacy Trail opened in 2008 and that more than 175,000 people a year use the 12-foot-wide multi-use path. The length of the existing section is 10.6 miles, he continued: from the Venice Train Depot to Culverhouse Nature Park in Palmer Ranch. In 2013, the Friends of The Legacy Trail petitioned the commission to extend the route, Brownman noted. In April 2015, he continued, the commission authorized staff to work with the Trust for Public Land to obtain an appraisal of the corridor. The trust Brownman explained, has experience and technical expertise in acquiring rail corridors, as well as fundraising know-how. 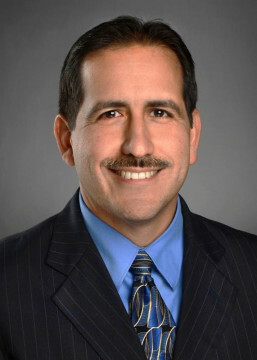 That background made the nonprofit a logical partner in the county’s efforts to acquire the North Extension property, he indicated. The trust has offices in several states; in Florida, its website says, they are in Tallahassee and Miami. The appraisal for the North Extension was completed in November 2016, Brownman said; it was updated in January. Although the appraisal “came in at approximately $44 [million],” a Feb. 15 county staff memo says, the trust negotiated a price between $36 million and $40 million. 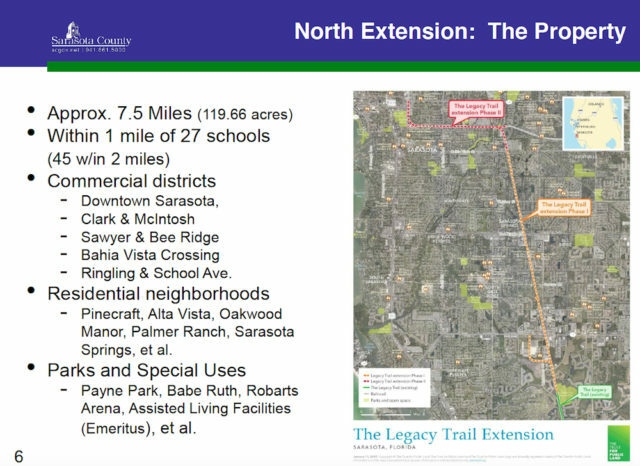 Brown noted that the North Extension would encompass 119.66 acres, and it would be within 1 mile of 27 schools; another 18 schools would be within 2 miles of the corridor. The extension also would be close to a number of commercial districts and neighborhoods, he added, and it would run behind Robarts Arena on Fruitville Road. Eight speakers during the Open to the Public segment of the Feb. 15 session urged the board to proceed with efforts to acquire the property. 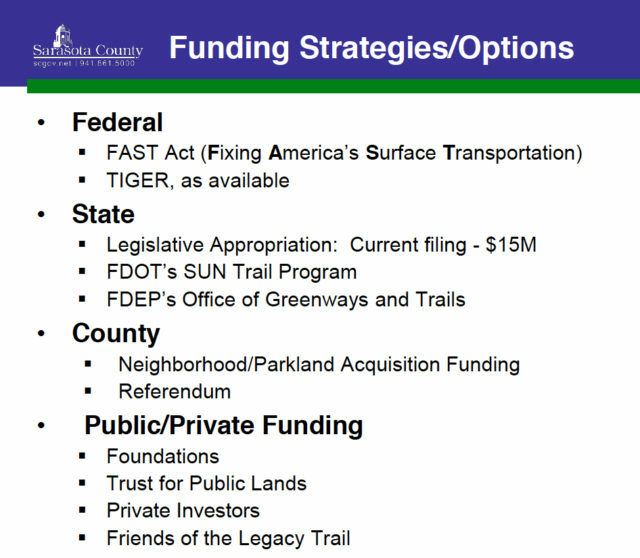 As county staff has researched options, Brownman explained, it has found “there is not a lot of money dedicated for acquisition” for projects such as The Legacy Trail. Detert asked for clarification about a bill state Rep. Joe Gruters has introduced in the Florida House, seeking $15 million in state funding to help with the North Extension. It was her understanding, she said, that $100 million allocated to bicycle trails was being divvied up over four years in annual grants totaling $25 million. Brownman confirmed that that was correct. “Isn’t it unrealistic of us to think we’re going to get 60% of the money for the entire state [for 2017]?” she asked. “We’ll have to see how the state votes on that,” Brownman replied. In looking over a list of potential funding sources Brownman showed the board, Commissioner Hines asked why Tourist Development Tax (TDT) revenue and county mobility fees were not included. “We didn’t get too deep into that,” Brownman replied of the TDT option, because of the county’s recently announced intention to use TDT funding to help pay for a new baseball complex in the West Villages near North Port, for the Atlanta Braves to conduct Spring Training and year-round activities. 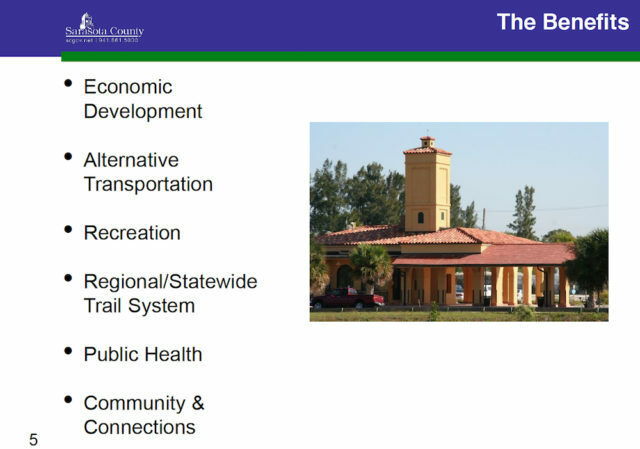 As for the mobility fees, Brownman continued, “quite a bit of those” are committed to the acquisition of right of way for the county’s portion of the extension of Lakewood Ranch Boulevard. In response to questions about holding a referendum to help pay for the high priority county projects, Brownman explained that, unfortunately, the board has missed the window to hold one in conjunction with the municipal elections that will be on the ballot this spring. Supervisor of Elections Ron Turner informed county representatives that Turner’s staff has to have 90 days of lead-time to put a measure on a ballot. Therefore, Brownman noted, the best opportunity for a referendum for financing The Legacy Trail purchase — and other county projects — would appear to be Nov. 6, 2018, when the next countywide general election will be held. Turner said the county would not have to pay extra to put a referendum on a general election ballot, Brownman added. If the county were to schedule a referendum at any other time, the expense would be about $450,000 to $500,000, Brownman noted. 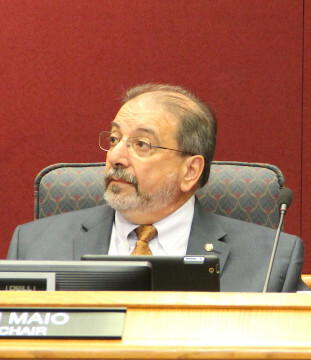 Brownman noted that if the county uses bond funds to pay for a project — in an effort to stay under the County Charter’s cap for borrowing without holding a referendum — the interest payments will have to come out of the General Fund, which comprises ad valorem tax revenue. “That’s one of our more constrained accounts,” Brownman added.